If you use one of the many online platforms available to rent a spare bedroom, provide car rides, or to connect and provide a number of other goods or services, you’re involved in what is sometimes called the sharing economy, freelance economy, or gig economy. Although this is a developing area of the economy, there are tax implications for the companies that provide the services and the individuals who perform the services. The sharing economy allows individuals and groups to utilize technology advancements to arrange transactions to generate revenue from assets they own, such as cars and homes or services they provide such as household chores or technology services. There are tax implications for the companies that provide the services and the individuals who perform the services. This means if you receive income from a sharing economy activity, it’s generally taxable even if you don’t receive a Form 1099-MISC, Merchant Services Form 1099-K, or Form W-2. This is true even if you do it as a side job or just as a part time business and even if you are paid in cash. On the other hand, It is important that you keep good records because some or all of your business expenses may be deductible, subject to the normal business deduction tax rules. If you received payments during the calendar year as a self-employed individual (including participation in the sharing economy) you may be required to file a tax return. This includes payment received in the form of money, goods, property, or services. You may also need to make quarterly estimated tax payments to pay tax on income that isn’t subject to withholding. US income tax is a “pay as you go” system meaning that taxes are due as you are earning income which is the reason for estimated tax payments for self employed or rental income, or withholding for employees. If you don’t pay enough estimated or withholding tax during the year you may be subject to penalties. 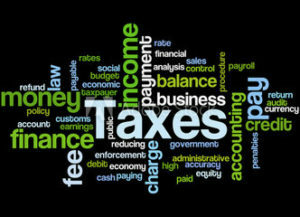 As your tax issues become more complicated by these and other issues, I recommend seeking the advice of an experienced and credentialed tax professional such as an Enrolled Agent or Certified Public Accountant. See my blog on “Choosing The Right Tax Preparer”.